The building now adapted to Portland School Apartments has graced a pretty hilltop overlooking Portland, MI, since 1919. It was recently restored and adapted as affordable apartment homes for families and seniors. May 1, 2018…Woda Cooper Companies, Inc. will host a Grand Opening and Ribbon-Cutting on May 10, 2018, at 10 AM to celebrate the opening of Portland School Apartments in Portland, MI. The event will include remarks from community leaders, representative of the developer, state housing leaders, and other supporters. Portland School Apartment features 29 new, one-, two- and three-bedroom apartments that were adapted in the fully-restored 1919 Portland School. The new apartments are affordable for seniors and working singles/families that earn up to 60% area median income. Portland’s school district closed the school in 1996. It was temporarily used for housing but sat vacant and decaying for many years. The City of Portland faced a costly demolition but Woda Cooper Companies, Inc, saw potential for creating modern affordable housing and set in motion a plan to help the City recover from a tornado that destroyed many downtown homes in June of 2015. Through meticulous restoration, Woda Cooper Companies has brought back to life Portland School’s grand Collegiate Gothic architectural features, including the brick and stone work, interior wood flooring, millwork, and more. The building is listed on the National Register of Historic Places. Large, historically-accurate windows, contemporary finishes, and many energy-saving features, including Energy Star appliances, are built into the lovely open-concept apartments. Three units are fully handicapped accessible. Amenities include an elevator, a large community room, fitness center, outdoor BBQ space and gazebo, off-street parking, and a new bus stop out in front. The nearby Brush Street Park features updated park equipment donated and installed by Woda Cooper at the onset of restoration of the school. Portland School Apartments earned fabulous support. 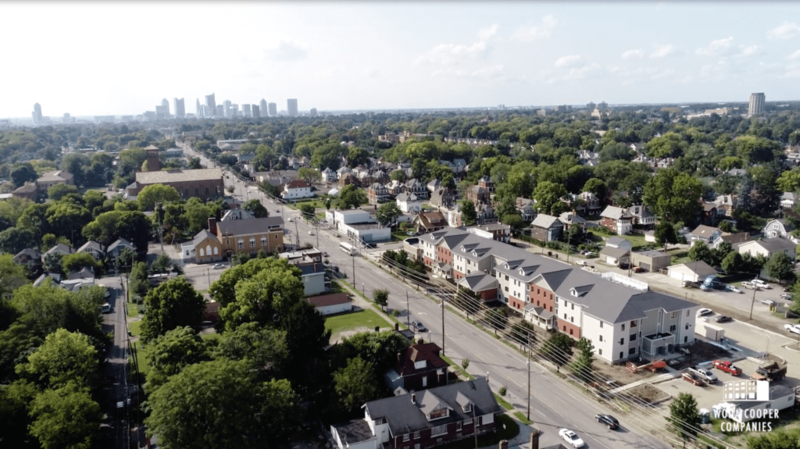 The $7.42 million development was made possible through Low Income Housing Tax Credits allocated by Michigan State Housing Development Authority and historic credits from the National Park Service. The City of Portland contributed an 8% PILOT. PNC purchased the tax credits and provided the construction, bridge, and permanent loans. Portland business and community leaders, and others interested in the historic school’s transformation, are invited to the Grand Opening and Ribbon-cutting celebration to showcase combined efforts of private and public sectors to address Michigan’s affordable housing needs. A kitchen and living space with large windows at Portland School Apartments. Brush Street Park was rejuvenated year when Woda Cooper donated and installed a new playground set to complement the family-friendly neighborhood. New community spaces with stylish, modern furnishings. An apple for the teacher? Much of the wooden gym flooring was restored and reused throughout the building.